It’s perfect for those terrible nights when you can’t fall asleep because your mind is going over All The Things on continuous replay. Pericardium 6 can be used for nausea and vomiting and is widely used for the treatment of morning sickness. It can also be used for nausea due to stomach flu. If you experience any type of stomach bloating or discomfort, especially around your period, Pericardium 6 is a great point for you. Not only does it help with the stomach pain, it can help the related irritability and emotional rollercoaster riding. Fun factoid: some people only have one prominent wrist tendon, so don’t freak out if you can’t find two. You’re totally normally abnormal. If you only have one tendon, the point will be on the thumb side of your single tendon. Once you find the tendons, you’ll need to measure the correct distance from your wrist crease to the point. Your wrist crease is the line wear your hand meets your arm. Acupuncture points are located using a system of proportional measurements. Various parts of your body are divided into a certain number of “body inches.” Your body inches will be different from everyone else’s body inches, and will even differ from area to area of your own body. Pericardium 6 is 2 body inches up your arm from your wrist crease. To find 2 body inches you can use your pointer finger. From the tip of your pointer finger to your first finger joint is 2 body inches. Now that you have your measurement and you know where your wrist crease is, you’re ready to find Pericardium 6! Place the tip of your pointer finger at your wrist crease and lay your finger down between your wrist tendons. Now Pericardium 6 will be right under your first finger joint. Slide your finger down your wrist towards your elbow so that the tip of your finger is now where your first finger joint was. The tip of your finger will now be on the point. Once your finger is on the point you can begin to gently massage the point. Sometimes it can feel achey and that’s a good indicator that you’re in the right spot. You may also feel the ache up or down your wrist from the point. All of that is normal. It’s also normal to not feel much of anything. It’s challenging to describe how much pressure to use through writing, so you’ll need to use your own judgment. You want to press firmly, but not so hard that you’ll hurt yourself and the tissues of your wrist. 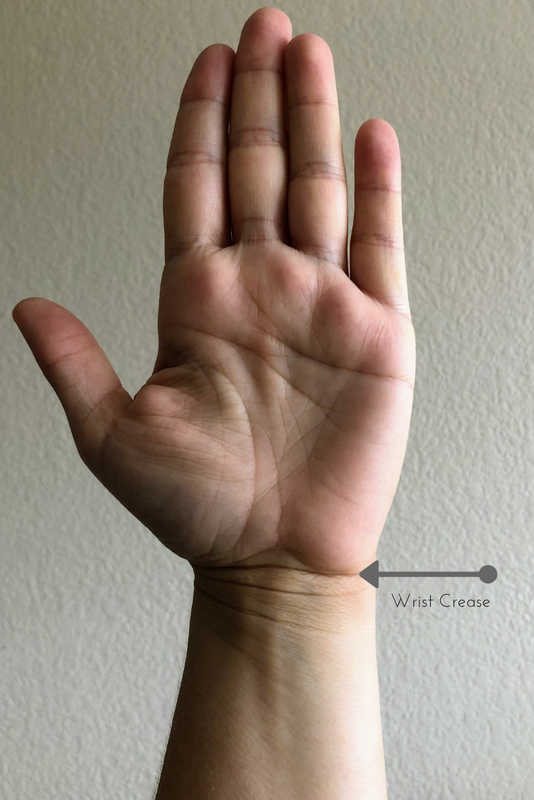 You’re not trying to stick your finger all the way through your wrist, just give enough pressure that it feels good while you massage the point for a minute or two. When in doubt, start with light pressure and after you’re more familiar with finding and massaging the point, you can gradually add more pressure. That’s it! Pericardium 6 is one of the most useful points in acupuncture and it’s a great tool to have… at your finger tips! Have you used acupressure on Pericardium 6 or had it needled? What was your experience? I’d love to hear about it in the comments below. Know someone who could benefit from knowing how to use this amazing point? Please share!